So remember how I’ve been craving black beans? Well that hasn’t changed at all and, luckily, they’re healthy and pretty much every recipe I use them in is fast. Yesterday, I spent some quality time on pinterest and discovered a new recipe for Black Bean Quesadillas. 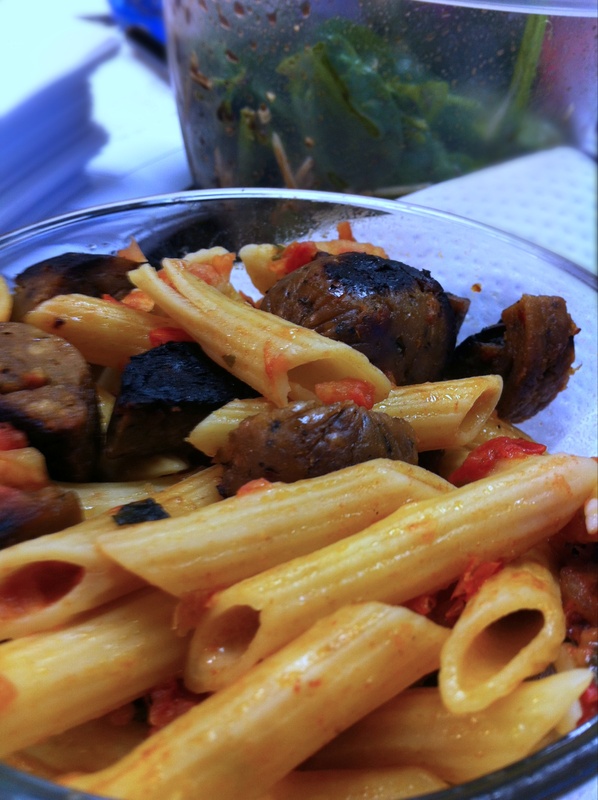 This recipe is super easy and very fast, two things I needed yesterday. I’ve probably mentioned this before, but there are times when I go from not at all remotely hungry to oh-my-god-I’m-going-to-die-of starvation-if-I-don’t-eat-immediately in a matter of minutes. Pregnancy has made this worse and yesterday around lunch time I hit that critical point more quickly than normal. So, I was pretty stoked that I had all the ingredients for the recipe on hand. Of course, there was a bit of hanger induced yelling when I put everything into my food processor only to discover that my food processor is, apparently, broken. No big deal in the long run though. I just mixed everything together and had a chunky filling instead of a smooth one. Still delicious. This is, unfortunately, one of those times when I was so hungry that I didn’t think to take a picture of the finished product. So, you guys don’t get to see that it was actually very pretty and colorful. Probably because of the un-food processed filling and guacamole topping. I know just my word with no supporting pictures isn’t the best advertisement ever, but you should seriously try this when you need something fast, healthy, and delicious. Ah, brunch. The best meal of the day. 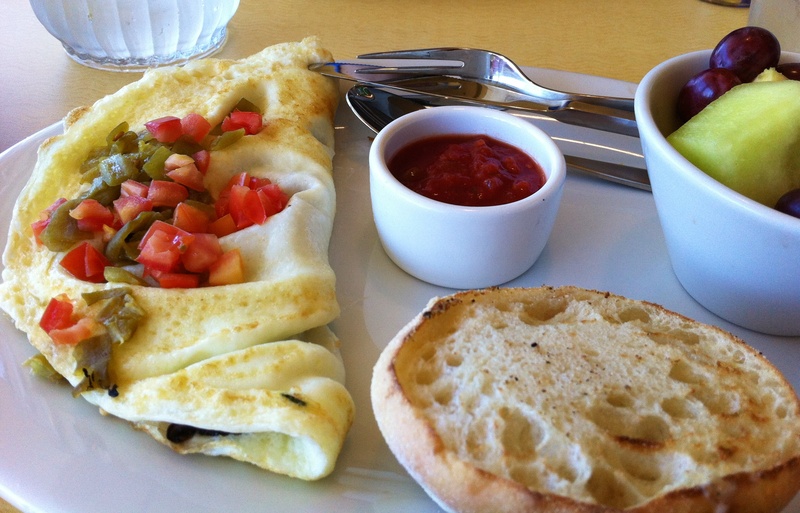 I’ve often talked about how I love breakfast and how its my favorite meal of the day. So, it should come as no surprise that on the beautiful first day of fall we had yesterday, I wanted to go out for brunch. Especially when I remembered that a new breakfast/brunch/restaurant had opened up down the street from my house.I’ve been excited about this new place for months now (pretty much as soon as I saw the sign announcing it was coming). While my side of town has a ton of mediocre chain restaurants for dinner there are actually zero places, local or otherwise, that serve breakfast and/or brunch. Of course, I was excited to go to brunch without driving across town. The new place, a chain called First Watch, wasn’t bad. But it wasn’t awesome either. It was just… meh. The menu looks really delicious, but our food could have been better. 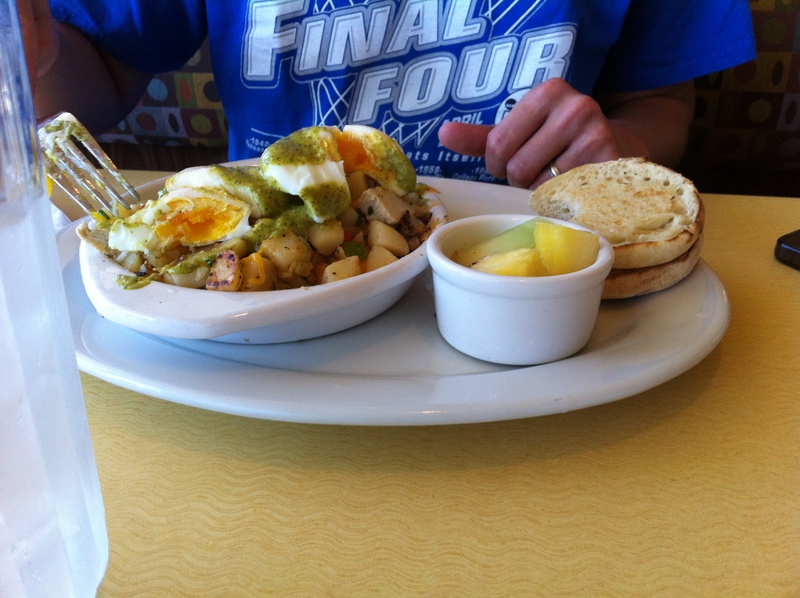 S. ordered a hash with poached eggs, that were waaaaay overdone, and pesto hollandaise. which was very tasty. My meal wasn’t bad. The omelet was fluffy and the side of potatoes I got was fabulous. But overall it just wasn’t great. Despite, this very lackluster first experience I’ll give it another chance. I really wanted to try the pancakes, but talked myself out of it at the last minute. This is really a very odd review for me. I don’t feel like I can really recommend you guys go to this place. But. It wasn’t so terrible that I feel like I should tell you not to go. So… basically, I guess if you really want some brunch that’s not super expensive and is pretty okay, try this place? Maybe? Oops. I’ve made a honey boo-boo. Back in May/early June,when I found I was pregnant, I went on a pregnancy book buying and reading spree. I read approximately 5 books about pregnancy (and plan to review them for you soon; some of them were much much better than others) and checked all of them pretty religiously when any new symptom appeared. You know, like a completely sane person. As part of my fanatical book reading research, I consulted the books to find out what I could and couldn’t eat. Of course, my OB also gave me a list (since I’m a vegetarian, my list is basically just unpasteurized dairy), but I still felt the need to double check all.the.time. Despite this, the one item that wasn’t covered in any of my books or by my OB and that I didn’t even think about checking on is honey. I eat kinda a lot of honey (I don’t eat refined sugar, so I use honey to sweeten most things I eat regularly), so I can’t believe I never researched it. This morning, though, I found this post from the Hip Chick’s Guide to PMS, Pregnancy, and Bodies. As it turns out, honey is safe in pregnancy, but the recommendation is to use grocery store honey because its guaranteed to be pasteurized. And that’s awesome. Except. I don’t eat grocery store honey. I don’t think it tastes great and I prefer to buy local honey as it helps (ever so slightly) with my allergy symptoms. What’s a girl to do? Frankly, I’m not sure yet, but I’ll probably find a honey substitute for the next several months. So… any honey substitute suggestions? Everyone always talks about the amazingly weird cravings they have during pregnancy. I haven’t had any really weird cravings (no pickles and ice cream here! ), but I have had some pretty strong, one might even say irresistible, cravings. Here are my top five cravings in no particular order. 1. Chocolate: I’m not usually a huge fan of chocolate. I mean, I like it, but I usually don’t crave it. Until now. I’ve been craving dark chocolate, which I don’t usually even like that much. I’ve not really been giving into this particular craving that often, but when I do I just have a piece of a chocolate bar. 2. Spinach: I always like spinach, so that’s not a huge surprise, but I want it at least 3 times a week these days. How have I been satisfying this? Well, I’ve been making smoothies and adding a handful of spinach in. I’ve also been making Italian Egg Drop Soup and having a lot of spinach salads. 3. Black Beans: Pretty much in any way possible. Black bean salsa dip, black bean chili, black bean tacos, black bean soup. Love. Them. And cannot get enough. 5. Watermelon: There’s not much to say about this. I’ve been eating at least one baby watermelon a week by myself. I’m really hoping that all this super hot weather we’ve had this year means the watermelon season will last forever, because if there’s one thing that’s really gross it’s out-of-season watermelon. 6. Sharp Cheddar: I know, I know. I said this was a list of my top 5 cravings. As it turns out, I have 6. I can’t stop eating sharp cheddar cheese. Really the sharper the better. I usually pair this with granny smith apple slices, but it’s not unusual for me to just eat slice. As I was typing this list, I realized I haven’t blogged a lot of these recipes yet. I’m shocked since most of these are my favorite recipes in general. So, expect a lot of recipe posts in the coming weeks! Did you, or anyone you know, have weird cravings while pregnant? 2. Put about a half inch of water (with salt!) and about a teaspoon of balsamic vinegar into a large skillet and bring to a boil. 3. Bring large pot of water (with salt!) and about a tablespoon of balsamic vinegar to a boil. 4. For the pesto: Add basil, pamesan, garlic, and pine nuts to food processor. Pulse a couple of times until a little paste-y. Add olive oil until the pesto starts to pull away from the sides. Note: I didn’t have any lemons, but a bit of lemon juice would be fabulous. 5. Add the green beans to the boil water in the large skillet. Cook for about 5 minutes (you want them to be crisp-tender), pull out, and shock with some cold water. (Shocking is usually done my dunking them in ice water; I was lazy so I just used really cold water). 7. 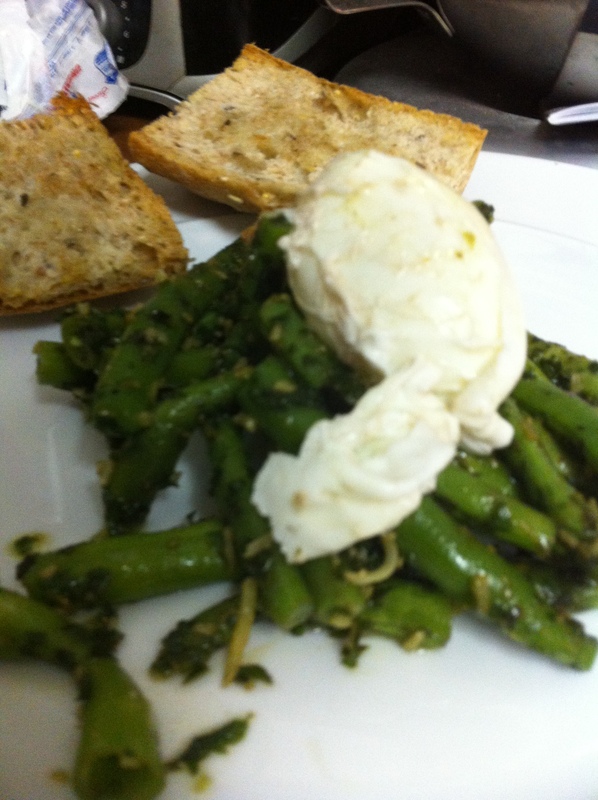 While the eggs are poaching (that should take 2-3 minutes), mix the green beans and pesto and plate that. 8. Put the eggs on top of the green bean/pesto mixture. Sprinkle a bit of parm on top. I should also mention that I served this with a bit of crusty garlic bread and a ham steak (for S.) and it was delicious. In fact, our only complaint was that we didn’t have enough for seconds! UPDATE: Thanks to Tammy for reminding me that I took a picture of this meal! Pregnancy brain is real, folks. And sometimes it makes you forget that you meant to include the crappy iphone picture you took of a delicious meal in your blog post. In case you missed the one million times I’ve mentioned it this week, I’m on vacation! Although vacation actually started Friday at 3:30, we didn’t actually leave for our destination until yesterday afternoon when we dropped our dogs off with my mom (thanks, mom!) and headed to Asheville. Asheville isn’t our ultimate destination, but we decided that pregnant Martha probably wouldn’t be happy if we did the entire drive in one leg. So, we stopped here on our way to the coast. Last night, after we arrived we headed downtown to find something to eat and to wonder around for a bit. We secured food AND live entertainment pretty quickly and spent the rest of the evening just hanging out and watching some live music. This morning, we decided to head back downtown for breakfast before continuing our epic journey east. We’re currently waiting to eat at Tupelo Honey… Normally pregnant Martha doesn’t enjoy waiting for food, but check out this menu! This is going to be fabulous! Hope your Sunday is just as awesome! If you’ve been following me on twitter today, you know that I’m officially on vacation!! Of course, this is roughly the most exciting thing that has ever happened to me. * But, like all things, there is a downside. This week my CSA share, which is normally shared with R., is all mine. And it’s full of tomatoes and corn and peppers and tons of other things that we can’t possibly eat all of before our trip. *Note to the future offspring: that was hyperbole. So, to use up a large chunk of the tomatoes, which, incidentally have been fabulous this year, I made fresh tomato sauce. I used a recipe that was included with the CSA this week. It’s really simple: Tomatoes, Olive Oil, Salt, Pepper, and Basil. I added some balsamic vinegar and food processed it all until smooth. After the sauce is complete, just add to some hot pasta and top with some Parmesan. Lunch today. I also added a tofurkey Italian sausage. This is basically a perfect summer meal, light, fast, and full of the taste of summer. Fabulous!